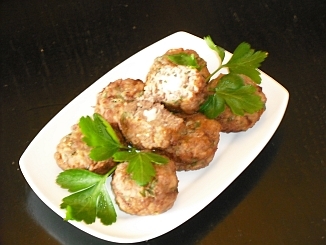 This is an easy recipe for Greek Keftedakia (small meatballs) with a difference. They are stuffed with Feta cheese and also have the Greek spirit ouzo in them. You should be able to obtain both where you live. This can be a side dish or a meze or snack. You can see the recipe for ordinary Keftedakia here. TA DOKIMASA KAI EINE TELEIA. Made these as part of a meze for christmas dinner and they were great. Loads of flavour and simple to make.